A year ago today, my daughter, Ruby Karp, also known as The Teenager on my blog, became a published author at the age of 17 with her book, Earth Hates Me. Please do pick up a copy, via the Amazon. I am re-blogging what I posted that day, her book birth day. I am so grateful to every person who bought the book. Every person that ran something on the book. Every person that posted about the book on social media. Every friend of mine who took time out of her or his week to do something on my daughter’s behalf. That friend of mine who already had a busy week, what with launching her own Very Big Thing, to spend a few hours in supporting of my daughter. My other friend, well family, the Upright Citizen’s Brigade, that allowed us to use Ruby’s monthly show as a celebration for the release of the book. Mindy Tucker, who took the cover photo. So much support, so much support, so much support. I am so thankful for it. So very thankful. So, here we go. One year ago today. Earth Hates Me. Today is going to be a good day. Today is going to be different. Today is going to be a big day. In fact, today is the day I walk into Barnes and Noble and Book Culture and maybe some other bookstore and find a copy of my daughter’s book, Earth Hates Me. 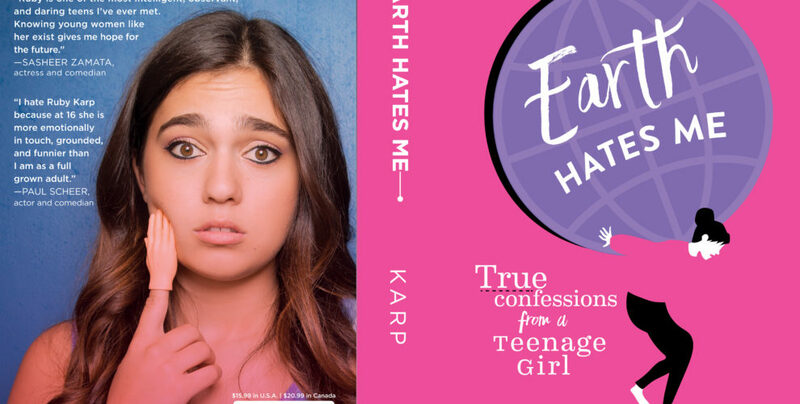 For the last year plus, my daughter Ruby Karp, has been working on her book, Earth Hates Me. It is finally available at your local bookstore today. Please head there, pick it up. Here are the things you may not know by looking at the cover. It has an intro in the form of a Q&A by Ilana Glazer from Broad City. It has a five step plan to getting over a heartbreak. It is a book for teens as well as adults, for different reasons. It has the story of that moment when I told her my Dad had died, how she handled it. It has the story of how comedy saved her. It has tactics in dealing with pressure–the kind a teenager feels at home, at school, from an object of affection. It is a reminder to teenagers to stay true to themselves, to not back down, to remember they are all their future. It’s funny too, despite the heavy they confront on a minute-to-minute basis. So, if you can, pick it up. It will cheer you up for sure. What you don’t know yet about Ruth Bader Ginsburg. Seriously, watch Maniac. And then let’s talk. Birth Control in the form of an app. What? And now have a laugh with Gina Yashere.